Twas the night before Christmas, and all through the house, not a creature was stirring, except for a Stinky mouse, who was getting drunk on egg nog and miller high lifes. If the Stinky mouse had any sense in him though he would have been getting snookered on Rogue's Santa's Private Reserve Ale, a most wonderful beer indeed. Somehow I don't think we have ever reviewed Rogue beers on this blog, but since the stupid search bar doesn't flippin' work, I can't find out (you think I am going to go through all 160 posts to find out? Pfffft). For the uninitiated, Rogue Ales is brewed in Newport, OR, a lovely small town on the coast of Oregon. All kidding aside, the Oregon coast is the awesomest place in America, even more so than Flagstaff, AZ. 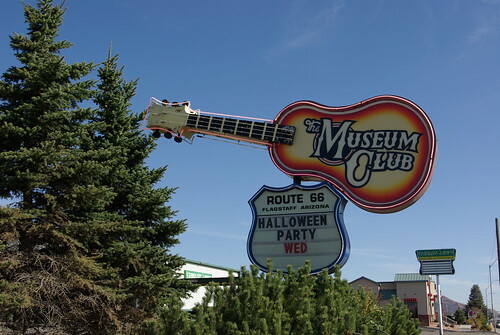 Definitely go there if you get the chance (the OR coast, not Flagstaff). Rogue has a nice little restaurant that goes along with their brewery, where they serve a mean adult mac n cheese (the macaronis are shaped like dongs). Rogue brews about a jillion beers, many of which can only be found at the brewery itself. 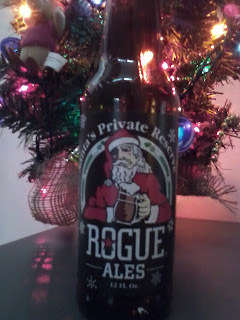 The Santa's Private Reserve Ale is a copper colored red ale that is similar to their Saint Rogue Red, but the Santa has double the hops, just the way I like it. This beer is excellent, as it has a nice malty and somewhat bitter taste, but its not overwhelming despite the 2x hops. If you like a mild bitterness to your beers, you'll like this one. This is just a great tasting beer, one that you can knock back easily, and get nicely blitzed with its 6.00% ABV. I bet you could have a 12 pack on Christmas Eve and pass out with no problem, then forget to put the presents under the tree and your kids are forever destroyed the next morning. I got a six pack of this at the incredible low price of $6.99 (regular price of $12.99). They were practically giving it away! To make a great situation even better, the heavily bearded hipster working the coffee section at the co-op told me I made a great choice upon buying the Santa's Ale. Compliments and a sale, oh boy! Hopefully you were a good boy or girl this year, as you'd be grateful to find a sixer of Santa's Private Reserve Ale in your stocking. Unless you'd rather have coal that is, then you're screwed.